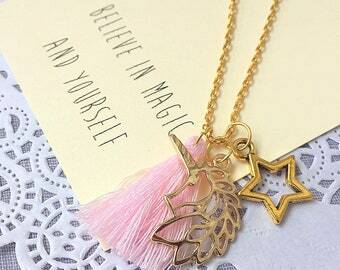 Give your gifts something magical to remember your party by. This listing is for (5) necklaces. 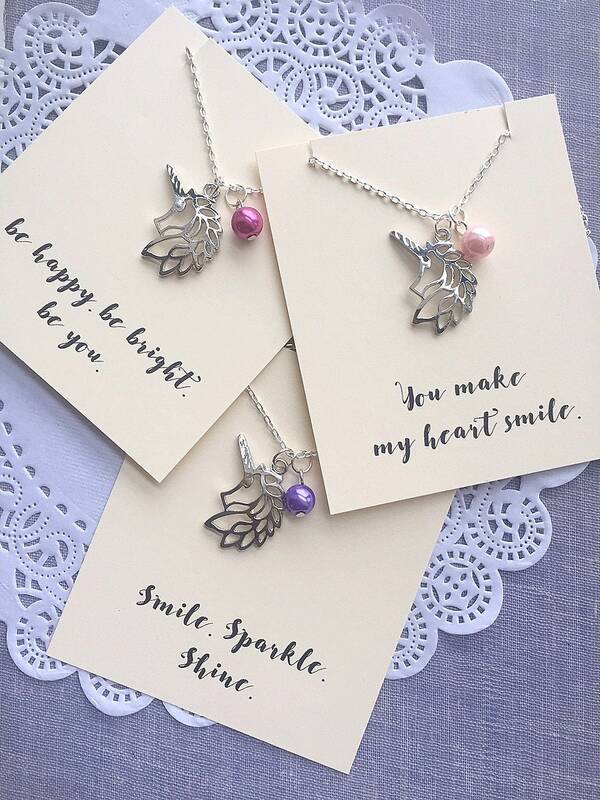 Each necklace comes with its own card inside a clear bag. ONE (1) Unicorn necklace, rainbow necklace, unicorn jewelry, rainbow jewelry, rainbow birthday party, party favor. Unicorn necklace, Unicorn gift, Unicorn jewelry, pastel rainbow necklace, pastel rainbow jewelry. Unicorn necklace, unicorn jewelry, unicorn birthday gift, tassel necklace, tassel jewelry, tassel, pink tassel, star necklace. Pastel Unicorn necklace, rainbow necklace, rainbow birthday gift, birthday present, rainbow jewelry, kids necklace, kids jewelry. Unicorn charm bracelet, unicorn kids birthday party favor, unicorn jewelry, unicorn bracelet, unicorn favor, kids jewelry, SET of TEN. Unicorn birthday party favor, kids bracelet, kids jewelry, jewelry favor, SET of TEN. Rainbow bracelet, birthday party favor, beaded bracelet, unicorn jewelry, rainbow bracelet, kids birthday favor, kids jewelry. SET of TEN. 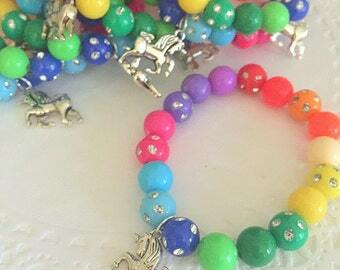 Unicorn rainbow party, birthday favor, kids party, beaded bracelet, colorful bracelet. SET of TEN. Unicorn kids bracelets, unicorn rainbow party, birthday favor, kids party, beaded bracelet, colorful bracelet. SET of TEN. SET of 15. 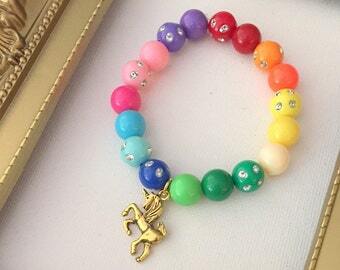 Rainbow birthday party favor, beaded bracelet, unicorn jewelry, rainbow bracelet, kids birthday favor. Running Gold Unicorn bracelet, kids birthday party favor, pink, kids party favor, beaded jewelry, unicorn jewelry, kids jewelry, SET of TEN. Pink Ombre Unicorn jewelry, unicorn kids birthday party favor, bracelet, kids birthday party, lootbag favor, kids jewelry, SET of TEN. Silver Unicorn bracelet, rainbow jewelry, MISMATCHED rainbow bracelet. kids birthday party, rainbow party. SET of TEN. Unicorn kids birthday party favor, unicorn jewelry, kids jewelry, SET of TEN. Pastel Unicorn bracelet, rainbow jewelry, MISMATCHED rainbow bracelet. silver unicorn, kids birthday party, rainbow party. SET of TEN.